Hello everyone! It’s been a few weeks since Grand Prix Vegas took place and it’s time to look forward to many more amazing events. 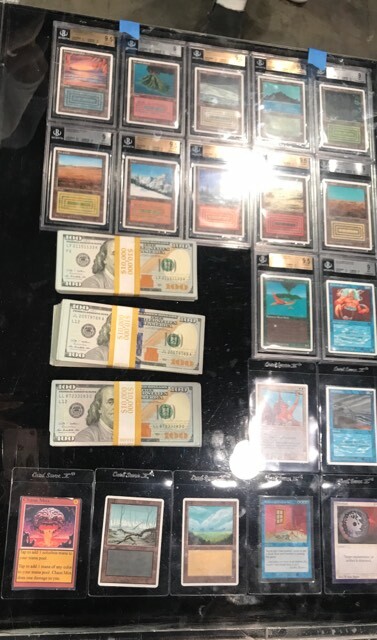 First though, I would like to conclude my article showing off the amazing and unique items I saw at the Grand Prix Vegas. If you missed part 1, here is a link to it! So without further delay, here are some more amazing things I witnessed, and even something I picked up there. Honey, I’m home! 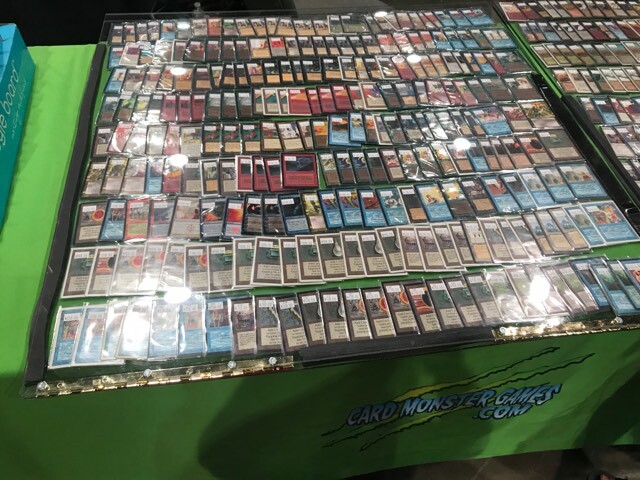 VintageMagic.com’s booth certainly had the lion’s share of Drop of Honey at the Grand Prix that weekend. It was quite the mover due to its showing in the 4th and 9th place Legacy decklists piloted by Jody Kieth and Jarvis Yu. This powerful reserved list spell is a new innovation for sideboards in the Lands deck. To start the weekend, you could still snag these off tcgplayer.com for under $100, but now you are looking to pay close to $300 apiece on them. Well who’s that? That’s me! Of course, being the Lands player I am, I had to take an opportunity to snag up a few copies myself. Being in the know about a card this rare spiking is surely helpful. I had to drop some really honey to buy these, but not as much as I would if I were to buy them today. There were many awesome sights down artist alley. 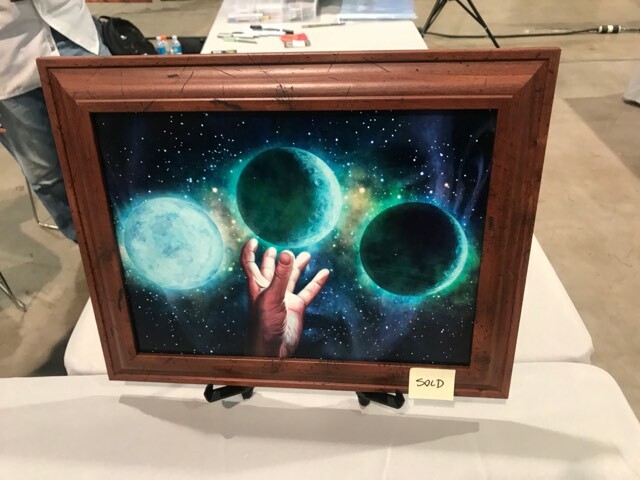 Dozens of artists were featured at this historic event and many brought with them prints, playmats, and original artworks. On display above is a painted print by Dan Scott of his Ponder artwork. Up close and in a frame, it really resembled an original artwork to the point where it even fooled me. I had been under the impression the artwork was done digitally (which it was) meaning a true original did not exist. The added brushstokes for texture really brought this piece to life. Who wouldn’t love to have this beauty hanging up on their wall? If you have a keen eye, you may have noticed this sweet alter from my Drop of Honey picture above. 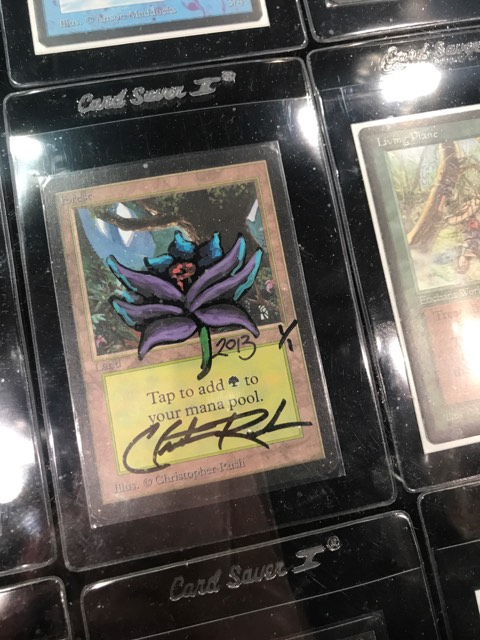 Also at the VintageMagic.com booth, was an Alpha Forest signed and altered by none other than the legendary Christopher Rush himself. A piece like this is truly special as Mr. Rush is no longer with us, but his artwork and love of Magic will always live on. Illustrating his iconic Black Lotus on this Forest, which could very well have been pulled from the same pack as one, is the icing on the cake. No one man should have all that power. 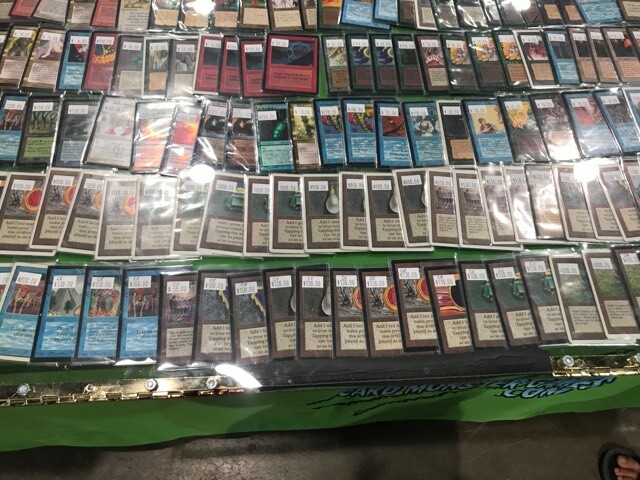 That sure is a lot of old school Magic goodness. 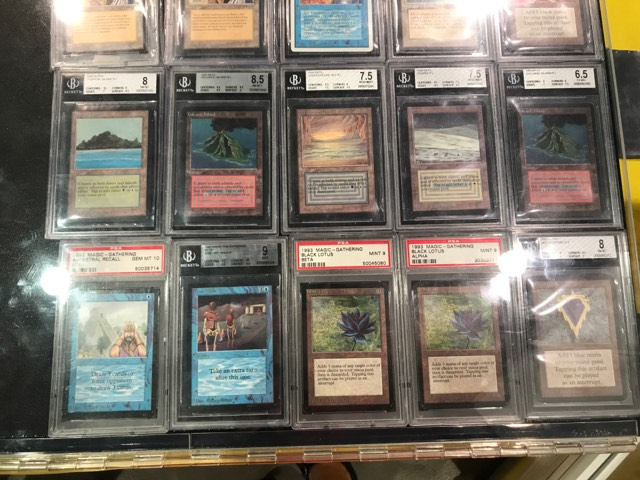 Literal rows worth of Power 9 cards, including black bordered versions? That’s enough to make my jaw drop. I just wanted to grab into this case and build a 93/94 deck right then and there. Okay Snapcaster Mage and Jace, you guys aren’t old school but it’s cool you can chill. Mahamoti will allow it. We coo. Do U Sea what I see? I see a down payment on a house worth of sweet cardboard crack right about there. 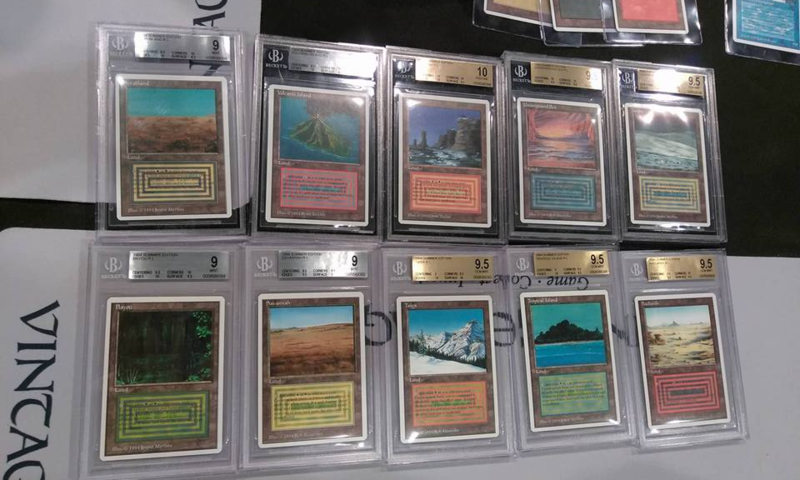 I would killll to play with some of these beautiful cards in all their black bordered glory. Imagine the powerful spells cast by these iconic dual lands. Serra Angel and The Hive most likely, but hey, casting a Jace, the Mind Sculptor off these in today’s era would make this girl swoon. Do you like your cards nice and minty? Well who doesn’t? These are some pristine cardboard rarities here. BGS and PSA 8’s and 9’s seriously skyrocket that price point, and for good reason. How can you one-up the next person’s Alpha Power and dual lands? Have yours graded and show off that pack-fresh godliness. Graded cards aren’t really for me. I have to take it out of the box and play with it! 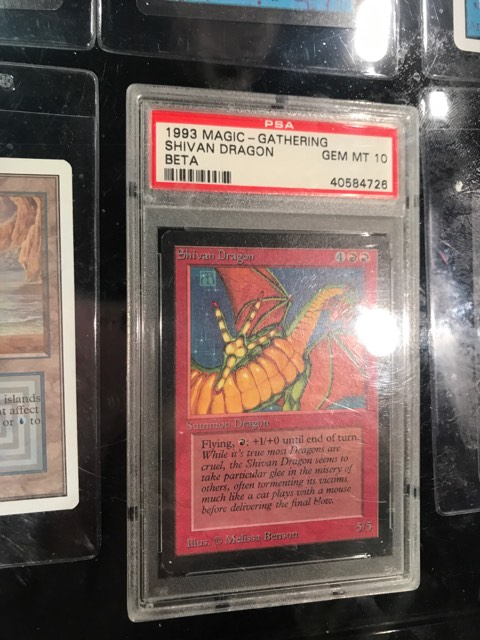 It might have been long before I started playing Magic the Gathering, but many old school players surely have played against their fair share of Shivan Dragons. 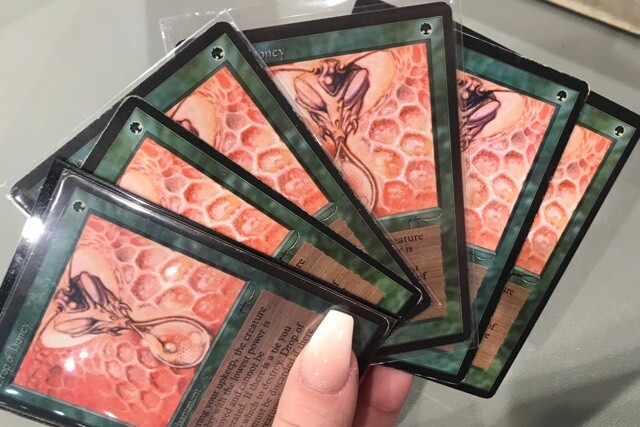 Gem Mint PSA 10 Beta Shivan is truly a spectacle and I would happily be scorched and engulfed in flames by this mystical and expensive piece of cardboard. Take my money!! Well look what we have here! Stacks of cash? Meh. Richard Garfield exclusive cards? Shrug. One of each Summer dual land. JACKPOT. I have never seen one of each Summer dual land in one place, and you likely never will either. The prices on these I couldn’t even begin to figure, I will just let you know it’s a lot. Better yet, I saw them out of the case and being negotiated on by a potential buyer. I can’t even imagine the amount of money that changed hands during Grand Prix Vegas, but I am sure it puts that wad of cash there to shame. Also, yeah, that’s a blue Hurricane just chilling there. Ohhh gurl, there she is! I was speechless seeing this beautiful card. 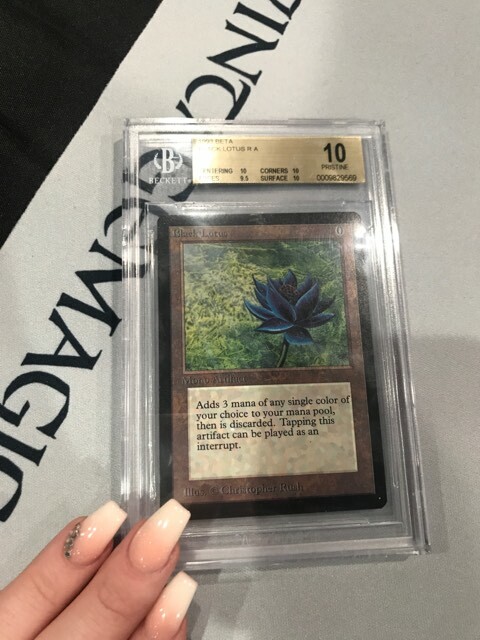 Easily the most expensive card in the room at Grand Prix Las Vegas, a BGS 10 Beta Black Lotus is easily worth upwards of $80,000!! Don’t let my nails fool you, I couldn’t afford this bad boy even if I sold my entire Magic collection and my car. I was just happy to bathe in its light. 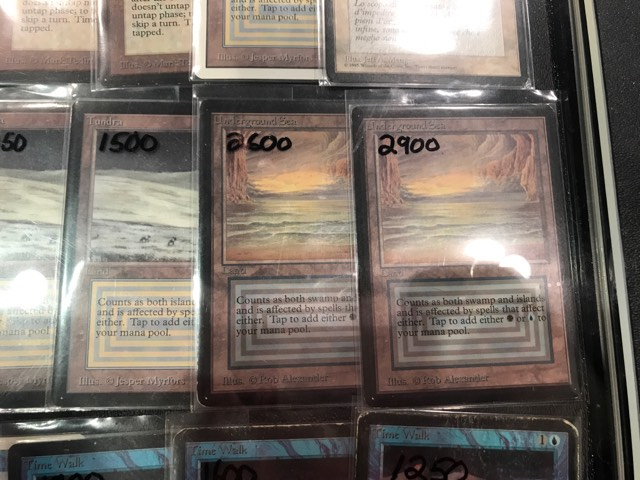 What a truly inspiring and unique piece of MTG history. 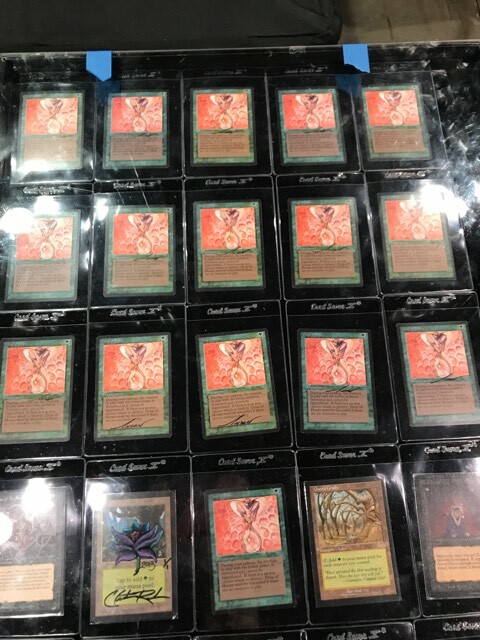 On the topic of inspiring and unique, there was far more to take in at the Grand Prix than just Magic cards. 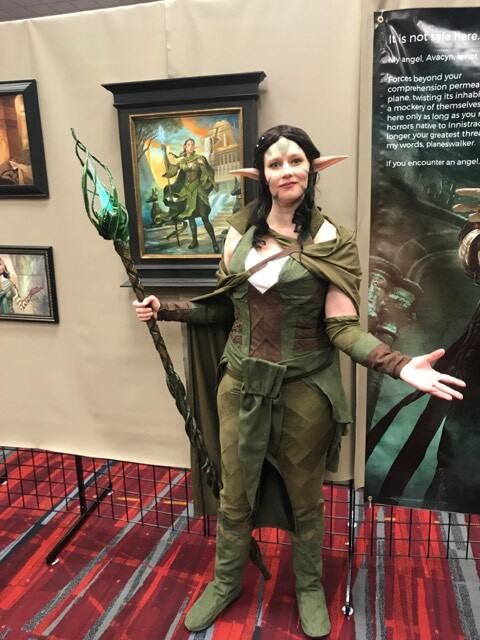 Here was a cosplayer posing as Nissa, Steward of Elements from Amonkhet. 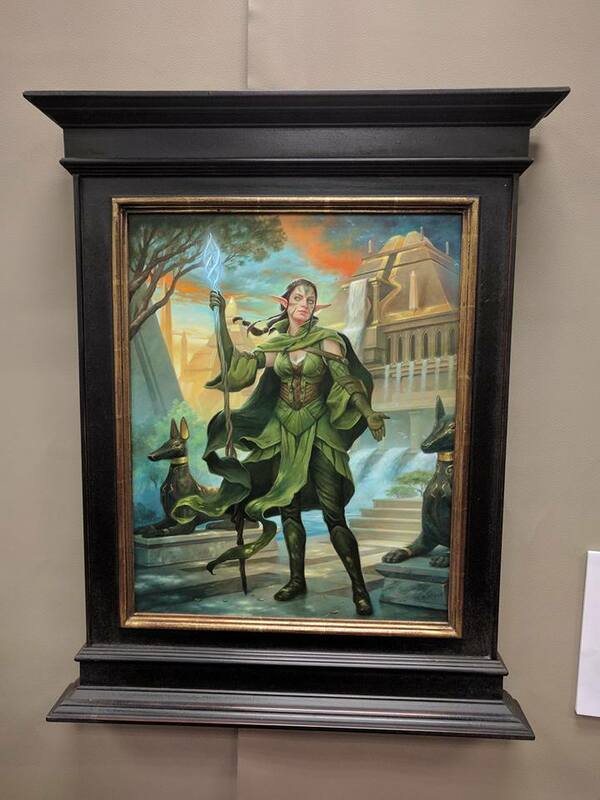 And right beside her, the original artwork for that very Nissa. Illustrated by Howard Lyon! Makeshift Mannequin from Lorwyn! I was so excited to finally see the artwork for the first time in person. A very kind person from the Facebook Mtg Art Exchange page, Luke, sold me this amazing piece and I couldn’t be happier. I absolutely love the colors and details on this piece as well as the lighting. 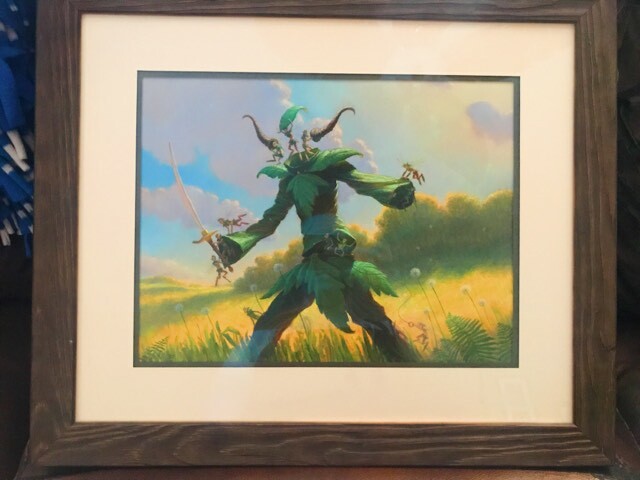 I love all things faerie and MTG, so when I saw the piece I knew I had to own it. Picking this up was one of the highlights from my trip to Las Vegas and I won’t soon forget it. And so there you have it. My Grand Prix Las Vegas adventure. 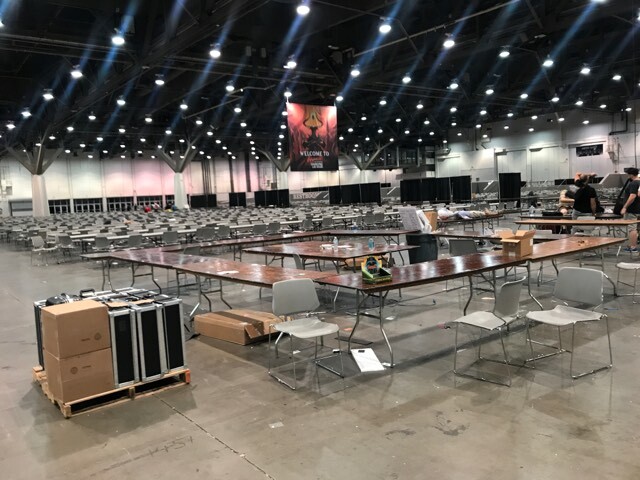 I was one of the last people to leave the event hall before closing time on Sunday, spending my last hours cube drafting the night away. I had a wonderful and magical time at Grand Prix Vegas and I would absolutely do it again next year! From all the artists and vendors to the friends and events, I couldn’t even express how much fun I had. I hope you also had fun living vicariously through me a little through these photo essays. I surely had a blast taking the pics and spreading the word. Thanks so much for reading! What were your favorite sights from the Grand Prix? Did you pick up anything cool? Let me know it the comments! Rachel Agnes is a VSL Competitor, Phyrexian Princess, Collector of all things shiny and a Cube, Vintage, Legacy, and EDH enthusiast. Catch on Twitch and Twitter via Baetog_. Hey just curious, whats the story on the textless basics in the same pic as the summer stuff?